The two-storey public atrium is one of the many additions to the building, incorporating innovative, green design. Designed by Farrow Partnership Architects (FPA) and associate architects Stantec Architecture Ltd., construction on the $214-million public redevelopment job was substantially completed in 2010. The project, the largest the Sarnia-Lambton region has ever seen, involved adding 30,193 m2 (325,000 sf) to the building’s existing 44,000 m2 (470,000 sf) of renovated space. This included a 2787-m2 (30,000-sf) surgical centre containing eight operating rooms and four procedure rooms to replace the existing facilities. Another component of the redevelopment project for Bluewater Health was the inclusion of a floor designated for maternal infant/child programs. This means the labour, birthing, and pediatric services were consolidated in one space, rather than spread throughout multiple floors. 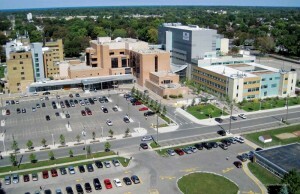 Some of the other elements of the hospital’s expansion included an emergency services area, underground parking, and a two-storey main entrance and public atrium. Sarnia’s Bluewater Health community hospital was certified Leadership in Energy and Environmental Design (LEED) New Construction (NC), making it the first facility of its kind in Ontario with the accreditation. co-ordinated modular wall assemblies and furniture systems. When the plans for the project began in 2001, the application for LEED certification was given to the U.S. Green Building Council (USGBC) because its Canadian counterpart (CaGBC) did not exist. 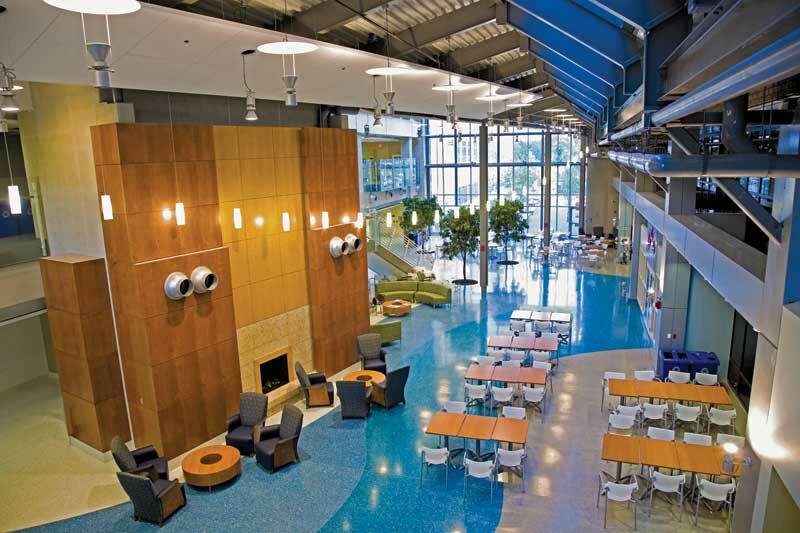 Tye Farrow, a senior partner at FPA, explains this is only the beginning for LEED healthcare facilities in the country being designed by the firm. He says some of the buildings being completed in the near future include the redevelopment of St. Mary’s Hospital (Sechelt, B.C. 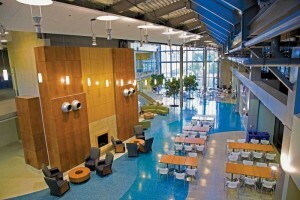 ), which aims to be the first LEED Platinum carbon-neutral hospital in North America. The firm is also working on what may be Canada’s first LEED Gold continuing-care hospital complex being constructed in Mission, B.C.